Once the fever to train sets in, awareness of one’s body becomes paramount. Buying into the excitement and perhaps difficulty of this or that training fad, an athlete can actually change direction and drift further from his goal by training harder. Unfortunately, in the world of difficult climbing, simply working hard does not equal progress. A climber must first find a goal to be attained through training, then find the best path to that goal. Only after this path is found can the business of hard work be effective. These days, athletes are subjecting themselves to some of the hardest workouts ever designed. Talk to many of our top climbers and you’ll hear details of workouts that would cripple your average weekend warrior. But these workouts are neither the starting point in their training nor the secret of their success. To move forward in any program, the climber needs goals, needs to really want to reach these goals, and must have the self-discipline to execute the plan. 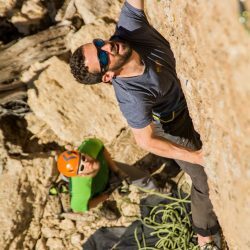 Unfortunately, many climbers reach a performance plateau and seek to break through it via training modes outside of climbing such as running, yoga, or high-intensity weight training. Although these are all valid modes of exercise, each is highly unlike climbing and will offer only limited training value. Specificity – Our bodies adapt to very specific demands of training. The more training mimics activity, the greater the benefit. This is why we get better at climbing when we spend time climbing. Pretty obvious. Accommodation – If continually subjected to the same stimulus, our bodies cease to respond. If you climb at the same area on the same routes, you can actually lose fitness. Overload – Related to accommodation, in order to advance in sport, the athlete must face regular stresses that are more challenging than current levels. This can come in the form of more time, harder grades, steeper routes, etc. Reversibility – When training ceases, the body begins the return to pre-training baseline levels. This is the depressing reality of taking long breaks from the rock. The most important of these when designing your plan, of course, is specificity. But that’s not enough. You’ve got to get really serious about being specific. Say you’re a boulderer and you want to get better at heel hooking on overhanging problems. Well, you can’t just go bouldering and hope to find some heel hooks. It’s better to focus a portion of your weekly sessions on this, then go into your normal climbing plan. 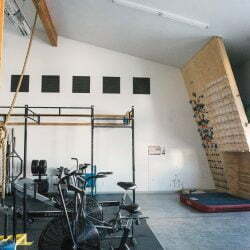 A normal bouldering session in the gym doesn’t allow for enough adaptation. The problem is that very few of us apply specificity to our goals, either at the crag or in the gym. We go out, gravitate toward climbs that suit us, get tired after a while and call it a day. Occasionally we’ll get with a motivated partner or just happen to go a bit harder. We’re wiped out and sore the next day, but did we move closer to that goal route? – Does the plan for today address the demands of my goal routes or my limiters? – Are the duration and intensity of the workout going to adequately tax my system? Will I be overdoing it? – Are my training partners appropriate for this session? “Going for it” really hard for 3 hours during the Thursday night session rarely makes a better climber. Consistency, specificity, and attention are all critical components of any good plan. There is no amount of intensity you can add to one session that will compare to a well-planned week. 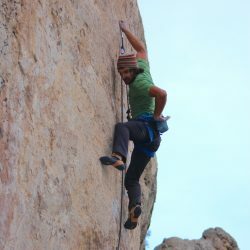 Your training needs to be focused on making you better at climbing, not just getting pumped silly. As an athlete nears his natural potential, improvements no longer come in big leaps but rather by inches. Remember that simply walking up to a cliff and working on a hard climb is not enough. Finding the route that best leads you to improve is the real key to success.